When actually were these flags used? 1856-1895? An item (not seen), in the Flag Bulletin [tfb] of Nov.-Dec. 1985 refers to the British and Foreign Anti-Slavery Society. Their agent David McKenzie operated a Free Port at Cape Jurby 1875 to 1895 and may have been in the Sus area earlier, but had no known connection with the Sus flag. However the design on the flag must be based on something? The coat of arms is also described in Vlaggen van alle Natien [stb62] published in Amsterdam, 1862. The map at www.mincom.gov.ma/french/reg_vil/regions/reg-f.html shows the province #4 Souss-Massa-Draâ, which is about the northern part of Sahara-Suz. The southern part of Sahara-Suz on that map is province #3, Guelmim-Es Smara, at present part of Morocco, but possibly claimed by Western Sahara. That part, north of and including Cape Juby (with Tarfaya) shows on old French atlases as part of Spanish Sahara (Saguia Hamra). 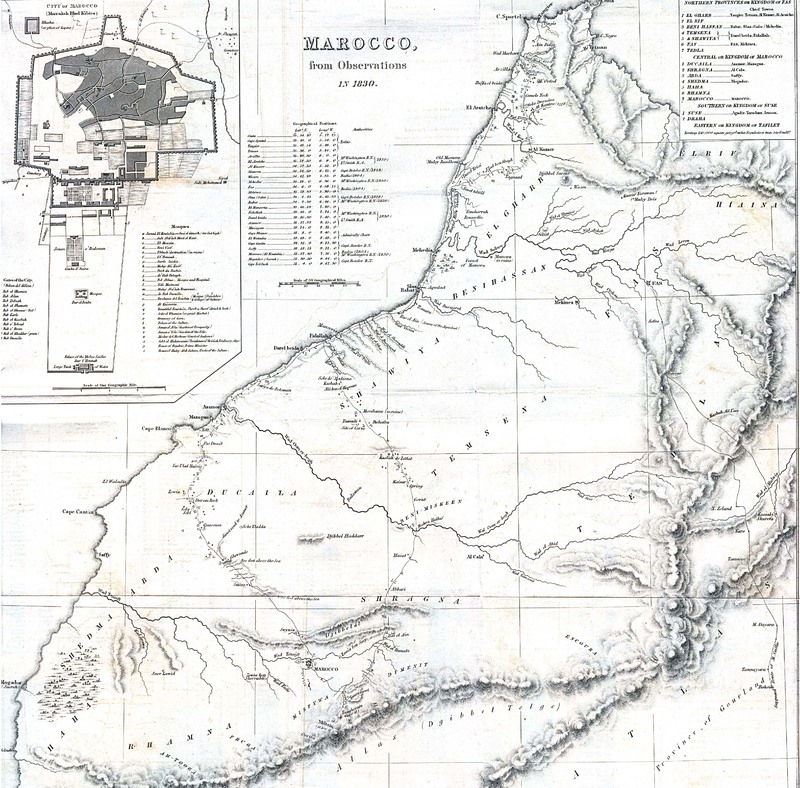 An 1830 map of Morocco (enormous 1362 kB JPG, but does not reach south of Marrakech) has a legend on the top right corner speaking about three kingdoms, the northern provinces making up the Kingdom of Fas (i.e. Fez), the central ones that of Marocco (sic) and the southern ones the Kingdom of Suse (sic). The latter are the provinces of Suse (for which it gives as chief towns Agadir, Tarudant and Irnoon) and Draha.